Archbishop Daniel Deng was born on 2 January 1950 in the village of Tuic-Gebiet in Bor County, Jongelei State and is of Dinka heritage. He was educated in Adong and Khartoum and at the age of 17 began work as a lay evangelist to Dinka living in Khartoum. In 1975 he began training for the ministry and received his certificate from Bishop Gwynne Theological College in Juba in 1977. He undertook further graduate studies at Virginia Theological Seminary from 1995 to 1997 receiving a diploma in theology. Ordained deacon in 1977 and priest in 1978 for the diocese of Khartoum, he served for 1978 to 1988 in Port Sudan planting several churches and opening schools, clinics and vocational training programs. In 1988 he moved to Renk to evangelize the region and built the first church in Renk Town and after he was consecrated first bishop of the Diocese of Renk in 1995 went on to build several schools and a theological college. In addition to his duties in Renk, he served as acting bishop of the Diocese of Malaka from 2000 to 2003 and acting bishop of the Diocese of Yei from 2007 to 2008, Secretary of the House of Bishops, and Chairman of the Peace, Justice and Reconciliation Commission. He was elected the fourth Archbishop of Sudan and translated from Renk to the Diocese of Juba on 20 April 2008. 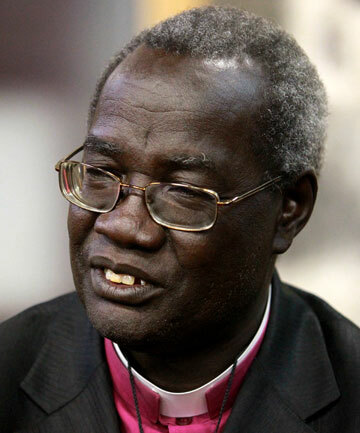 As archbishop he played a prominent role in the formation of an independent South Sudan and presently serves as mediator between the warring factions currently dividing South Sudan. He is a member of the GAFCON primates council and the Global South primates group. He is married to Mama Deborah Abuk Atem. They have five children and three grandchildren.